I am a big Disney fan with Beauty and the Beast being my favourite of the classic Disney films so this Mrs Potts Teapot is right up my street. It comes with its own wire funnel filter and you can even buy a Chip mug to go with it. Kit & Kin was co-founded by Emma Bunton of Spice Girls fame and uses natural, eco-friendly ingredients and sustainable materials. They have a range for baby and mums and one of their bundles would be the perfect gift for somebody expecting a baby around Christmas. I am a big fan of a nice photo canvas and Vistaprint provide a fuss-free service with affordable options for every budget. Alternatively, their range of photo books would also make a lovely gift. Bath products can be a bit hit and miss as gifts but these Dead Sea Bath Salts, available from Boots, are fantastic. They have both frankincense oil and rose petals and work to relieve tension and stress whilst revitalising skin. 1102 candles are made using soy wax which burns cooler and lasts longer than paraffin. The Apple & Cinnamon fragrance is really festive and the Chocolate Fudge scent is a guilt-free treat. I am a massive fan of The Book of Everyone. Being able to personalise pages throughout the book makes for a more unique gift, and I love that you can even include pictures. These books are lovely keepsakes. Jewellery doesn’t have to break the bank. Jewellery Box have an extensive range of beautiful pieces from as little as a few pounds as well as gorgeous stands and storage to keep your trinkets safe. I absolutely love the pieces I was recently sent including the seasonal snowflake necklace, lilac star stud earrings and emerald pendant. This poster is perfect for anybody aged 30 or soon to reach the milestone birthday (like me, eek!). It includes 30 things to do during your 30th year, which can be scratched off to encourage an adventurous year! Available from Find Me a Gift. Sweets that taste like prosecco? The Personalised ‘It’s Prosecco O’Clock’ Prosecco gummies are the perfect present for lovers of fizz. These tasty treats come in a plastic jar which can be personalised with a name and message, plus they are alcohol free so can be enjoyed guilt free. The adorable Crafter’s Companion Crochet Kit comes with everything you need to make a cute companion including yarn, tools, stuffing and a crochet hook. The easy to follow instructions make this a gift suitable for all skill-levels. Kits available include Leo the Lion, Pippa the Panda, Rupert the Rabbit and the miniature handheld Charlie the Cow. This Jimmy Choo L’Eau gift set is beautiful and includes both the 60ml fragrance and 100ml body lotion, making it great value. Perfume Click have a range of gift sets available including cult classics and lesser known brands as well as makeup and skincare. 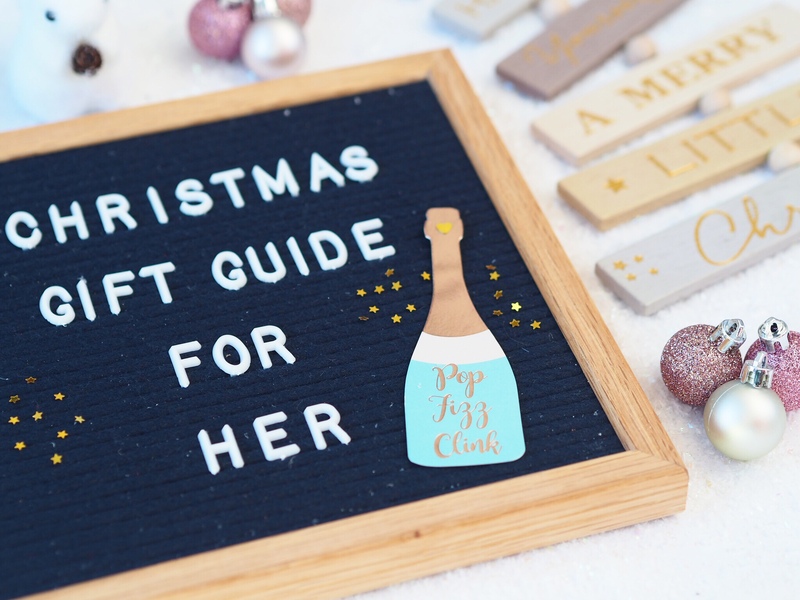 Vistaprint are well known for their business cards and supplies, but did you know they also have a brilliant range of photo gifts perfect for Christmas? Their photo mugs make a nice change from a traditional framed print and you can opt to add on matching items to your order, like this Photo notebook, which can also be personalised with a line of text. Lots of people opt to learn a new skill as part of their New Years resolutions, this Calligraphy and Hand Lettering book from Haynes would be perfect for those looking to try something new or improve on an existing talent. The book is beautifully illustrated and full of different styles with clear and concise instructions as well as advice on tools. Including projects such as wedding invitations, menus and decorative ideas for the home. Christmas is the perfect time for getting together and playing games with friends and family. What Do You Meme? from Men Kind is a fun party game which can be suitable for the whole family (there is a NSFW collection as well for adults only). Pick a photo card, place it on the easel and choose from the caption cards to compete for the best meme. Similar in concept to Cards Against Humanity, this is sure to be a hit at festive gatherings. I am a big fan of gifts that are useful and ProCook have a vast range of products that would make lovely presents including this set of 3 Chinese bowls. The set includes a small, medium and large bowl in the contemporary ‘sea mist’ design. Made from porcelain, the bowls would make a really nice gift. Forget Me Nots remind me of my grandad and this Forget Me Not Teardrop Pendant from Find Me a Gift is beautiful with a dainty and delicate chain and real forget me nots preserved inside the pendant. The necklace comes in a gift box and would make a beautiful present for a loved one or friend. The Secret Pillow project was set up to empower women through making and selling the products, providing a fairer than fair trade price and good working conditions. The Secret Pillow unfolds into a blanket, which makes it a lovely two in one gift with the added bonus of helping a good cause with your purchase. The pillow comes in variety of different designs, is machine washable and comes with a reusable cloth bag. How cute is this set of Donuts Ladies Socks? With 6 adorable designs, packaged just like a tray of donuts, this would be a lovely practical but fun stocking filler or secret Santa gift. These Procrastination Pencils from U Studio are brilliant for those who work from home and perhaps find their surroundings a little distracting when trying to work. The pencils each have a funny slogan etched on one side such as ‘A to-do list, you need a to-do list’ and ‘You probably need another coffee’, and would be perfect as a stocking filler. Also available from U Studio are an extensive range of notebooks including the Little Plants design. Brilliant for stationery lovers! Leighton Denny have a fantastic range of nail varnishes as well as accessories such as the Crystal Nail File and their Rock Solid strengthening treatment, both of which would be well received and useful over the party season. KISS have a brilliant selection of products including an extensive range of false lashes. These Lash Couture Opulence lashes are perfect for Christmas parties and celebrations. Speck provide phone cases which are as sleek as they are protective. Their cases offer premium protection, using high quality durable materials. Winter can be tough on skin. The Dr Paw Paw balm, made with fermented Pawpaw from Papaya fruit, can be used as a moisturiser for both lips and skin as well as a hair treatment. The peach pink and ultimate red shades add a little colour to lips and cheeks. Pop a Ball is the perfect addition to your drink over the festive season. The bursting juicy bubbles can simply be added to your drink to give it a hit of colour and flavour. This limited edition Pineapple Bursting Bubbles would make a lovely additional gift this Christmas.